December 5, 2017, at 10:20 AM here at LAX on the Southwest flight headed for Chicago. Last night and yesterday were a blur of rushing around to create this exit. We tucked ourselves in early knowing the 5:15 AM alarm in Ojai would jolt us out of sleep. And just before settling in, a loud beeping noise began – the electricity went out. The beginnings of an unusual night – we did not know that the Santa Anna winds had started a fire in Santa Paula, Ventura and upper Ojai. Waking at 5:15 AM, begins the rush to get ready to leave. And the electricity is still out – so this time we’re moving around in the dark with flashlights. I’m ready and begin the process of locking windows. I get to my studio to see the sky a deep red color – a color creating the effect of warning. Going to the cell phone I see a text warning regarding the fires. Now I wonder if we can travel out on the 33. Apparently, it is safe to travel this direction so we continue on. Now the evidence of smoke is really clear in the sky and the redness appears smeared across the sky. As we drive through Ojai, the stoplights are not functioning – again another sign of the power outage. We pass through Casitas Springs and finally are able to pick up speed heading south towards Ventura when we see on our left-hand side the mountains burning, smoke billowing up. Red, volcanic looking bursts of fire sending their smoke skyward. Is it a blessing we’re leaving town on a business trip? Everything seems so eerie and disconcerting. I have the telltale sore throat from the air quality overnight and the tiredness too. The Santa Anna winds tend to alter my sleep pattern, so I’m agitated, anxious. And the fact that our friends Erik and Rhonda evacuated last night from Ventura just as a building close to them burned down adds to it. And, here we are on a plane. It all seems strange, eerie and weird. Will we have a house to come back to? And, shouldn’t we be there? But there isn’t anything I can do, I’m not a firefighter. So it means waiting is all there is. We certainly live in a time of big unknowns. Being present to all of it is the only possibility. Yes, I’m writing about the Thomas fire. While in Chicago, we kept looking up the website info on the fire’s progress. And, what we could see showed at one point the fire progressing towards our house from two sides. We felt so out of the loop being so far away. Eventually, I called the hotline to discover our house was indeed intact. Lucky and blessed are the words that come to mind. 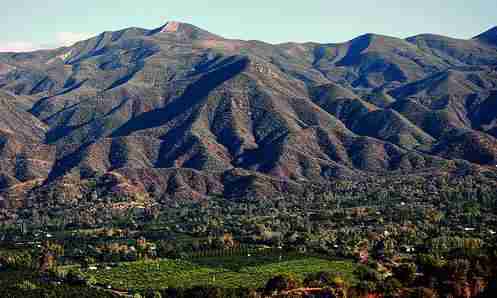 Our journey back into Ojai on Monday, December 11 was with some trepidation. What will we find? And, can we stay there with the heavy smoke and ashes flying around? painterly way with one color fading into the next. I noticed three different colors on each piece of the set of five vessels in The Wave we own. And each time Keith uses them for meals we think of her and are transported back in time to the moments at the show where we’ve helped each other and laughed to get through the day. Marge provided a helping hand. And, doesn’t this reflect the time of year? Perhaps reaching out to each other with assistance on a regular basis might bring us all closer together. Community can be created for each other on a daily basis if open to it. A kind word here and there; opening a door for someone with their hands full, or even sharing a laugh. Small deeds lead to overall compassion and warmth. And, as one of my small deeds, I’d like to make this offer. For every piece sold from now until the end of January, I will donate 5% to the Thomas Fire Fund, vcunitedway.org, an organization devoted to helping victims of the fire. Without the firefighters, American Red Cross, and the Sheriff’s Office of Emergency Services, Ojai may not have survived. And, I’m sure the Ojai Land Conservancy will have a job ahead of it in cleaning up the trails we hike daily so another 5% will go to the Ojai Land Conservancy, ovlc.org. Thanks again for all your support. And have a wonderful holiday season. Be sure to hug your friends and family for me!